MANAGING THE ART CLASSROOM: PART I: THE CULTURE OF POVERTY - DOES IT MAKE CLASSROOM MANAGEMENT MORE DIFFICULT? PART I: THE CULTURE OF POVERTY - DOES IT MAKE CLASSROOM MANAGEMENT MORE DIFFICULT? A lot of leaders in art education write about "what works" in the area of classroom management and they repeat the same rhetoric I heard in college: "as long as you have engaging lessons, keep the kids busy, and have great rapport, then you won't have any discipline problems." "In one study of 81,000 students across the United States, the students not in Title I programs consistently reported higher levels of engagement than students who were eligible for free or reduced-price lunch (Yazzie-Mintz, 2007).... Are children from poverty more likely to struggle with engagement in school? The answer is yes." "Seven differences between middle-class and low-income students show up at school:" physical health, vocabulary skills, effort/work ethic, ability to pay attention, ability to have strong relationships, belief in one's own ability to learn and grow (growth mind-set and hope for the future), and level of distress. 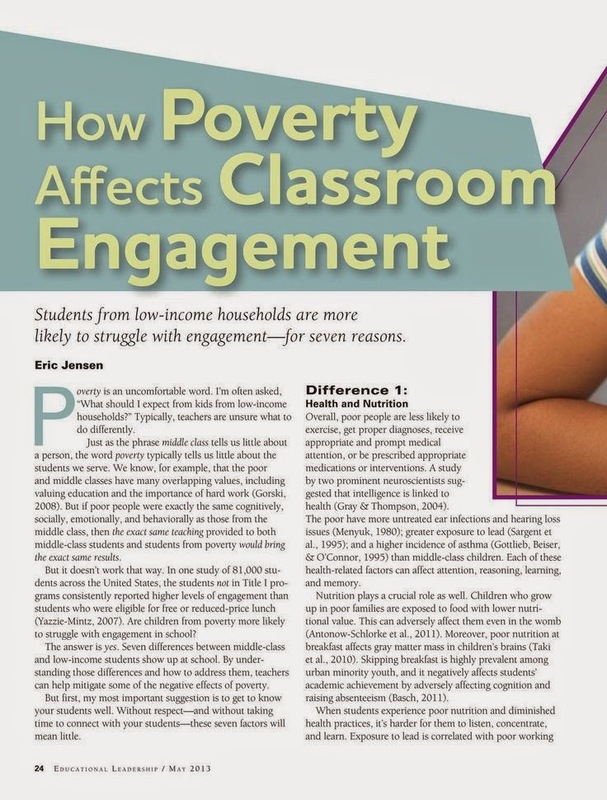 HOW Poverty Affects Classroom Engagement, by Eric Jensen, Educational Leadership 70.8 (2013): 24-30. Academic Search Premier. "(At high poverty schools)...classroom behavior frustrates teachers, especially in high schools, and teacher turnover is strongly predicted by students’ perceptions of their peers’ behavior (Allensworth et al., 2009). ...Teachers also may leave in response to apathy or disengagement that undermines their teaching and leaves them feeling unsuccessful (Metz, 1993; Public Agenda, 2004; Steinberg, 1996). It concerns me that a lot of leaders in education teach us that, "all you need to do is have great lessons and strong rapport in order for your discipline problems to disappear." In my opinion, this is a myth that merely serves to discourage teachers, especially those of us who have higher proportions of at-risk students. I am in the process of researching how poverty can effect student behavior in the classroom - does it make classroom management more difficult? If so, what strategies could a teacher in these higher poverty schools employ? All the teacher needs to do is have great lessons and be a high energy, charismatic teacher for discipline problems to disappear. Having positive relationships with students will take care of discipline problems. The responsibility for student achievement belongs to the teacher. If students/classes are out of control it is entirely the teacher's fault - none of the responsibility belongs to the students, their parents, the administration, or the school/community itself. #2: illustrate how destructive it is for a teacher to lose his/her cool in the classroom. #3: provide resources and outline specific, effective ways a teacher can manage high-poverty cultures. 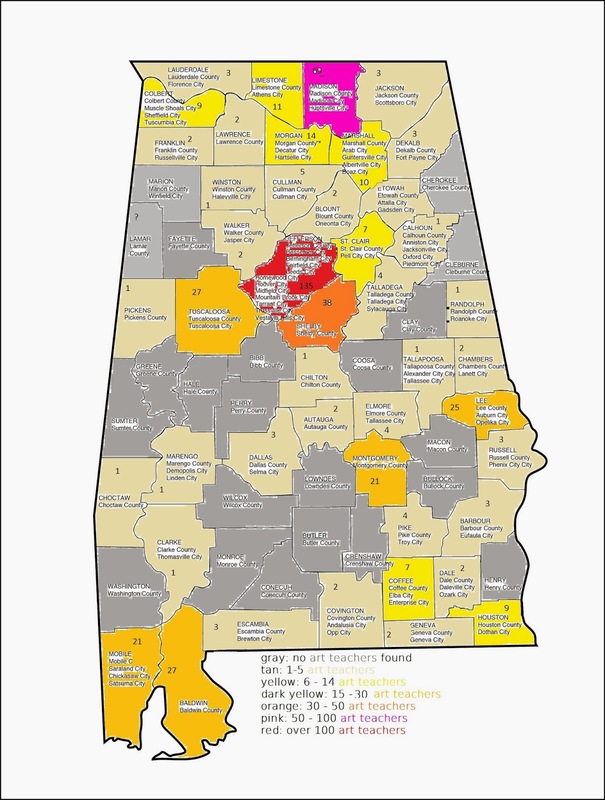 Below are two maps of Alabama. 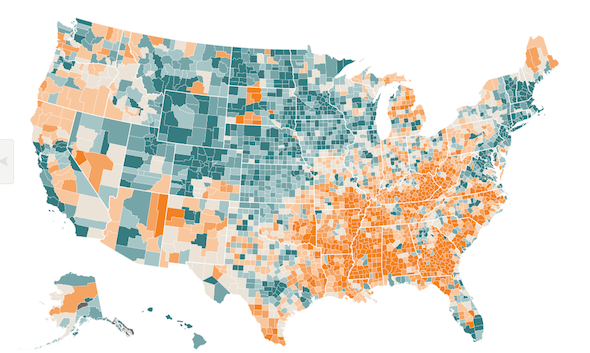 The map on the right shows how many public school art teachers we found last year (2013-2014) per county/school district. Gray counties had no art teachers listed on any of their school websites. Tan counties had between 1 - 5 art teachers, yellow between 6 - 14, dark yellow between 15 - 30, orange between 30 - 50, pink 50 - 100, red + 100. 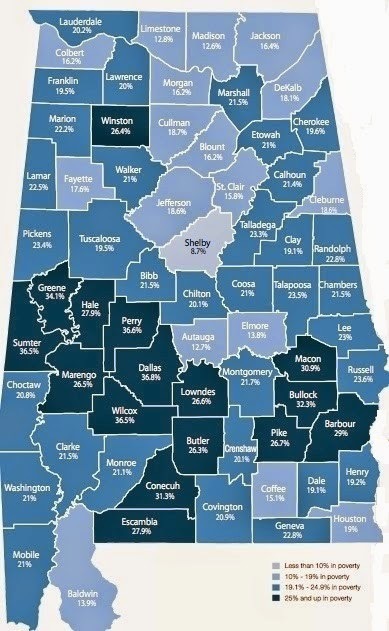 The highest numbers of art teachers were found in Madison County (69) and Jefferson County (135). Interesting article. I have taught in several schools, with varying degrees of poverty. Classroom management has made a HUGE difference at different income levels. Yes, it will be even worse if you don't have engaging lessons, but it is hard to even get to the lesson sometimes, depending on the school. 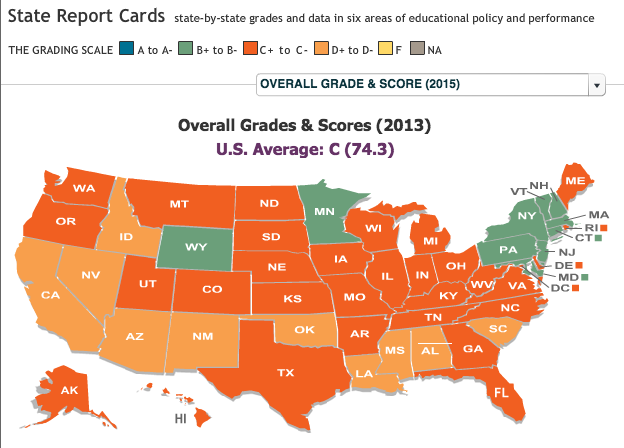 At some level, an overall school climate matters as well, independent of income level. I've taught in lower income schools that had better climate, because the expectations were different. Also, the way that misbehavior was dealt with SCHOOL WIDE was different as well. 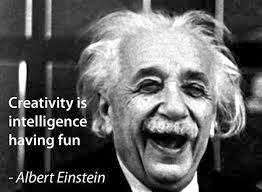 You are right - school culture definitely has an effect on student behavior. I will be talking about this as well as other variables in the next articles. Stay tuned! I think that school culture has such a big impact on the classroom that I make it a point to be involved at the campus level. As an arts person, I think it's important to be a presence that reminds the administration that we are working with kids and they are people. My administration has been very supportive when I come up with a school wide initiative and am willing to help get it going. At least one of my ideas is now going district wide. The benefit, besides happier kids, is when I need something for my program, my administration does what they can to support me. What was your idea that caught on?